I have started to watch my rental movie several hours ago. But now I have to do something else. Maybe I will miss the ending of the movie. So does anybody know how to extend the iTunes rental movie beyond 24 hours? Perhaps many iTunes Store users have the same problem. Renting movies from iTunes Store do help users save more than purchasing, even some rentals only costs 99 cents, but iTunes rentals always comes with more restrictions. You only have 30 days to start watching a movie rental. After you start watching the movie, you have 24 hours to finish it. If you don’t start watching a movie within 30 days, you must rent it again. The article here would explain why there exists 24 hours limitation of iTunes rentals and how to extend the iTunes rentals beyond 24 hours. 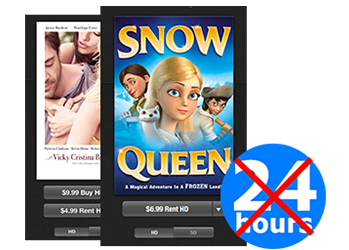 Why is there 24-hours limitation on iTunes movie rentals? iTunes videos, including rentals and purchases, are tightly protected by Apple FairPlay DRM, which controls what you can do with the digital media and devices you own. With the DRM protection, you can only enjoy your iTunes rented or purchased videos on authorized computer or Apple devices. Under such restriction, you just cannot enjoy the movie you've purchased or rented as you want. So, there are many people ask if there is any way to help remove the Apple FairPlay DRM, so that they can enjoy their purchased and rented media files without any restriction. The article would introduces you a wonderful iTunes DRM Removal to bypass iTunes DRM and convert iTuens M4V to other plain video formats. 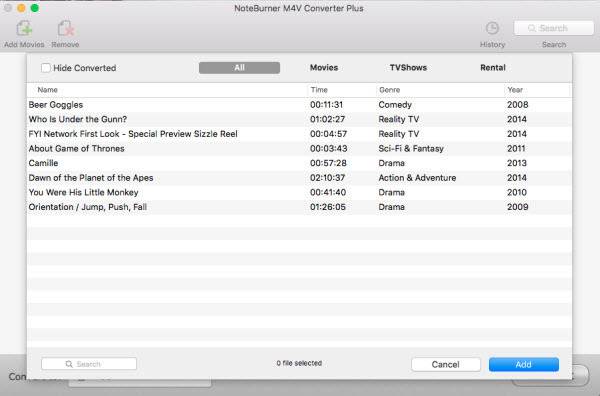 To remove DRM from iTunes rentals, the impressive and intuitive NoteBurner DRM M4V Converter for Mac can help you. It is specially designed to remove DRM from iTunes purchased and rented videos. It can convert iTunes DRM M4V videos to MP4, MOV, AVI and FLV at fast speed with lossless quality. If you are running Windows PC, NoteBurner iTunes DRM Removal for Windows is also available. Make sure the iTunes rentals are in valid period and not expired. Launch NoteBurner, click on the Add Movies button, then you will see the pop up window which will show you all the iTunes purchases and rentals. Select the iTunes rentals you want to convert and then click "Add" button. The added video will show up on the main panel after adding. Then you should move to the bottom left to find the button after "Convert to", and set the output formats as you want. Browse the menu bar to find "NoteBurner M4V Converter Plus > Preferences" to set the output path in the pop-up window. When finishing customization, click on the Convert button at the bottom to start the conversion. During the conversion, please make sure you are not clicking on the button to control iTunes. Then you just need to wait till the conversion is completed. If you are running Windows PC, you can refer to how to remove DRM from iTunes Rentals on Windows.